The most significant period in the story of AC/DC? Jeff Apter plots the key events of the iconic rock and roll band’s rise to fame. Jeff Apter is as well placed as any to tell the stories behind AC/DC. His biography of Angus Young and ghost writing the autobiography of former bassist Mark Evans as well as their former manager Michael Browning’s own account, give him a unique insider’s perspective. 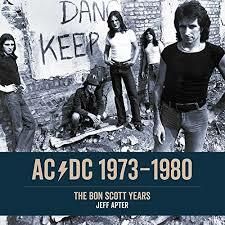 Of course, when a band makes it as big as AC/DC have, there’s always an interest in the early years so we get a pretty decent account of the time in fact before Bon joined the band. One presented in chronological from, year by year accounts with diary styled entries that sees the story of the Youngs and of Bon Scott running parallel until the planets collide and Bon declares with no modicum of subtlety, that he could do better that the “drongo” singing with the band. Packed with snippets of images and facts that cause either an eyebrow to be raised on that tickle, there are some nice shots of Bon in shocking red that cause chaos with the saturation as the band pose from promos while Angus has a few choice opinions too with soundbites that aren’t too complimentary on anyone. Even Robert Plant on Zep’s Australian tour in 1972 gets a tongue lashing, the Punk scene when they hit the UK is lambasted as “shite” and “hippie cunts” come in for the occasional reported bashing too. There might not be too much that the dedicated fans won’t have read or photos that are unpublished – almost all showing the changing fashion trends of the Seventies while Angus remains consistently unchanging, seemingly photoshopped into the shots in minor variations on his standard school uniform. Setlists and gig details fill out the text which recounts the volume of dedicated hard work the band put in to cut their teeth in Australia before the action switches into true international mode and they hit the UK. There’s also a chance to appreciate the impact and support of the Countdown programme that features regularly in the early days before the band really broke and continued as waves of support started to gain momentum. Of course, with the benefit of hindsight, you know all the punchlines. A hard working rock and roll band who cut their teeth on the live circuit and whose ascendency seemed suddenly accelerated by Scott’s death and of course a tremendous album in Back In Black. Looking back from the current point at which AC/DC most recently fronted by Axl Rose have become almost a comic book hard rock act and from Malcolm’s recent death to Brian Johnson’s issues with performing live, those early days and records now seem so iconic. Perhaps best remembered as they were.